Real time video programming and manipulation. Wobble is a distortion of visible reality. A live video stream is warped and compressed, creating a sea-sick inducing ripple with the video. While appearing visually complicated, the actual effect is quite easy to create. The incoming video image is broken into three rows and three columns, like a tic-tac-toe board. The horizontal and vertical scale of each piece is controlled by a sin or cosine function, so that the 9 pieces shrink and grow together. 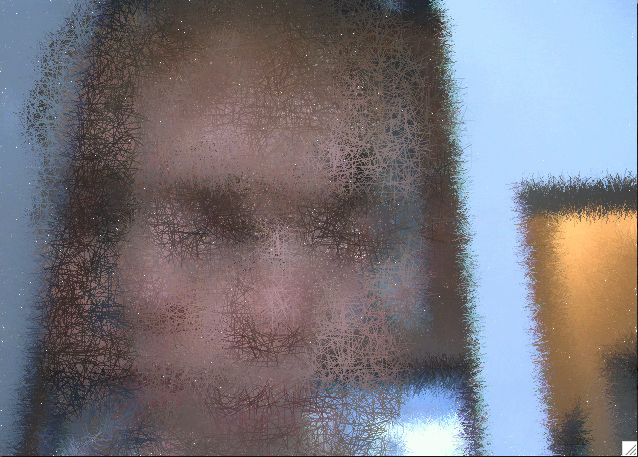 The result feels like a much more complex ripple across the whole video image. On Mac OSX (10.2 or higher), and some supported Linux system, you can use the wobble.sh shell script to compile and run the program. For windows systems, or if for some reason the shell script fails to work, the following commands will compile and run the program. SlideGame is a computer controlled version of the classic numbered tile game. In the numbered tile game a 4×4 square containing 15 tiles (one missing tile) is the game board. The goal of the game is to use the empty space on the board to shift around the tiles, trying to rearrange them into their original order. SlideGame uses a much larger game board (20 by 40), with a single tile missing. The computer controls the movement of the tiles, and the only goal is to continuously move tiles around. In SlideGame the tiles aren’t numbered, rather they represent chunks of live video. When the game starts the video is in the correct order. As a tile is moved, the chunk of video moves along with it. The result is a jumbled set of tiles of live video. On Mac OSX (10.2 or higher), and some supported Linux system, you can use the slideGame.sh shell script to compile and run the program. For windows systems, or if for some reason the shell script fails to work, the following commands will compile and run the program. Pointillism tries to recreate the painting technique of the same name, as applied to displaying a live video stream. For each frame of video a series of points are choosen; for each of these points a color is extracted, and a small point drawn to the screen with this color. The result has interesting effects when the image is perfectly still, and when the contents of the video are moving. As objects within view of the camera come to rest, the pointilistic representation becomes clear; when objects are moving the screen becomes jumbled, with faster objects becoming lest distinct, slower more distinct. On Mac OSX (10.2 or higher), and some supported Linux system, you can use the pointilism.sh shell script to compile and run the program. For windows systems, or if for some reason the shell script fails to work, the following commands will compile and run the program. Similar in theory to the Curves program, PickupSticks creates an abstract representation of a live video stream. From each frame of video a few hundred points are choosen. From each point a color is extracted, and used to colorize a line drawn through the point. This line is composited with all previosly drawn lines to create an image. 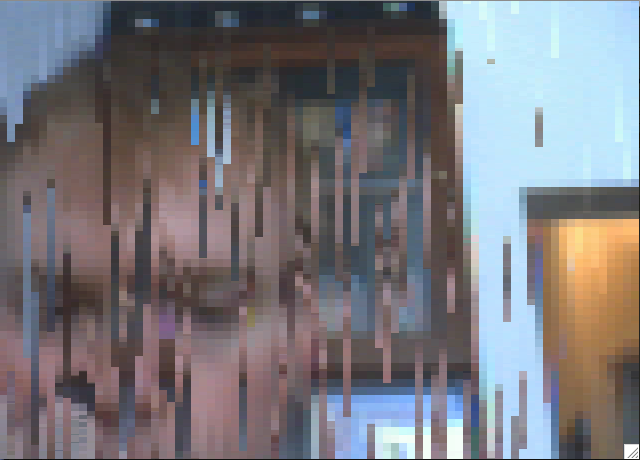 This is is the representation of the video stream; though only a handful of pixels from each frame of video are used to convey the view of the camera, the results of these pixels collected over time creates an interesting view. On Mac OSX (10.2 or higher), and some supported Linux system, you can use the sticks.sh shell script to compile and run the program. For windows systems, or if for some reason the shell script fails to work, the following commands will compile and run the program. The Particles program collects a live video stream, and divides the stream into a series of columns. The video from each column is updated to the screen only a few lines per frame. Each frame the portion of the column updated to the screen advances, until in reaches the bottom of the column, at which point it wraps around to the top of the screen to start again. Each column of video moves at a different rate, so one column may take much longer than another to fully update. On Mac OSX (10.2 or higher), and some supported Linux system, you can use the particles.sh shell script to compile and run the program. For windows systems, or if for some reason the shell script fails to work, the following commands will compile and run the program.